The remarkable Quakers Yard Viaduct, also known as Goitre Coed Viaduct, was constructed as part of Isambard Kingdom Brunel’s single-track Taff Vale Railway that connected Merthyr Tydfil to the docks at Cardiff. It carried the track over the River Taff near Treharris. The viaduct remains but has been widened to accommodate a second track, which is still use. The whole structure is Grade II* listed. The Taff Vale Railway was the first in Wales to be powered only by locomotives and the railway company that constructed it appointed Isambard Kingdom Brunel (1806-59) as engineer for the line and its structures. Its original track was standard gauge (4ft 8.5in or 1.435m). The northern section, from Abercynon to Merthyr Tydfil, opened on 12th April 1841, and the first rail traffic trundled across Quakers Yard Viaduct on 21st April 1841. Quakers Yard got its name from a nearby Society of Friends burial ground that went out of use in 1891. Brunel’s masonry viaduct is to the south east of Quakers Yard railway station, and its westernmost arch passes over the former Merthyr Tramroad (completed 1802), now part of the Taff Trail cycle route. The viaduct is slightly curved in plan and set at a skew angle to the river. Overall, it is 32.3m high, with six arches of 15.2m span each. The masonry is pennant sandstone, which has tooled detailing on all visible faces. Brunel was concerned about the potential for scour to damage the foundations of the river piers. To minimise this, the piers are octagonal in plan, aligned with their sides parallel to the river's axis. This was an innovative idea, removing sharp corners that could obstruct river flow and possibly lead to cavitation. Substantial pediments cap the piers and the rounded arches have deep chamfers, echoing the angled pier faces. The railway’s gradient between the Quakers Yard Viaduct and nearby Abercynon was too steep (up to 1 in 19) for the locomotives of the 1840s, so trains were cable-hauled by a stationary steam winding engine, which was located at the southern end of the viaduct. Welsh artist Penry Williams (1802-85) sketched the viaduct when construction was almost complete. The resulting oil painting is reproduced on the cover of Brunel in South Wales, Volume I: In Trevithick’s Tracks by Stephen K. Jones (2005). In 1861-62, the structure was widened as part of the project to make the Taff Vale Railway double track throughout. Engineer John Hawkshaw (1811-91) designed the new work, which is of plainer masonry, with unchamfered arches and rectangular piers, and located immediately adjacent to the original against its outer curve, on the downstream (north) side. 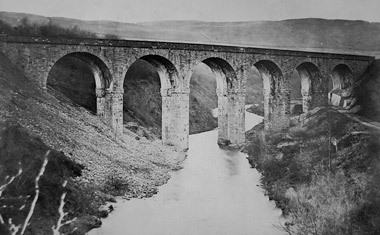 The picture above shows the viaduct some time after 1862, looking from the north. Hawkshaw's work faces the viewer, with Brunel's work behind. On the right hand side, the route of the Merthyr Tramroad is visible. In 1864, the cable-worked incline south of the viaduct was reconstructed at a shallower gradient (1 in 40). In addition, trains of the 1860s had more pulling power and did not require the winding engine. In April 1988, the structure was Grade II* listed. On 9th April 2006, plaques in Welsh and English were unveiled on the viaduct to commemorate the 200th anniversary of Brunel’s birth.